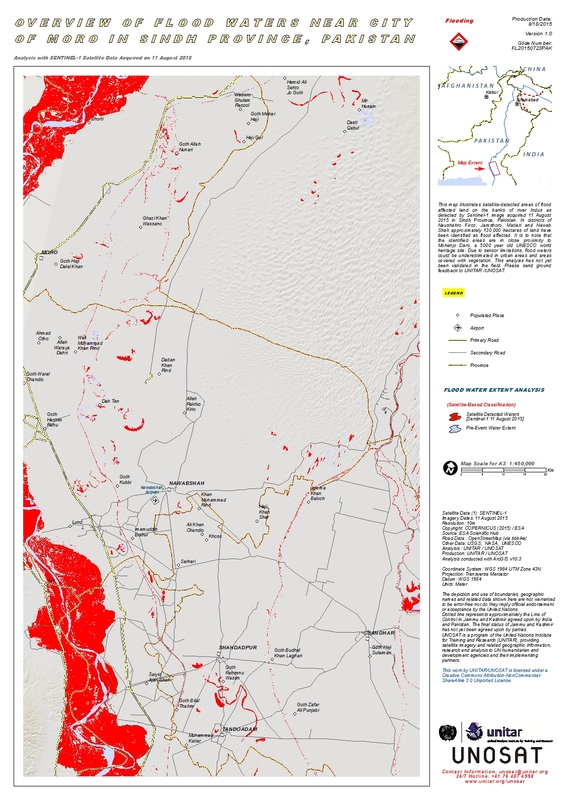 This map illustrates satellite-detected areas of flood affected land on the banks of river Indus as detected by Sentinel-1 image acquired 11 August 2015 in Sindh Province, Pakistan. In districts of Naushahro Firoz, Jamshoro, Matiari and Nawab Shah approximately 130,000 hectares of land have been identified as flood affected. It is to note that the identified areas are in close proximity to Mohenjo Daro, a 5000 year old UNESCO world heritage site. Due to sensor limitations, flood waters could be underestimated in urban areas and areas covered with vegetation. This analysis has not yet been validated in the field. Please send ground feedback to UNITAR /UNOSAT.